As part of the drive to industrialize Akwa Ibom and create business opportunities, the state government has reached an agreement with some private developers for the commencement of an industrial park and jetty project in the Ikot Abasi area of the state. Governor Udom Emmanuel, who headed the government delegation, assured the contractors, 3W Alliance (Ltd) and allied partners that his administration would do everything possible to support the speedy completion of the project which spans five Local Government Areas. He maintained that he has put in place a structured transaction process that would ensure that the project is sustained beyond the lifespan of his government, saying: “The business is structured to survive no matter who is in the saddle tomorrow”. Stating that natural resources are useless if not properly harnessed into effective productivity, Governor Emmanuel affirmed that he has extracted support for the project from the host communities. The Governor, who jokingly said that water can only be transformed into wine, depending on who is conducting the prayers, added that he has reached an understanding for an harmonious relationship between the developers and the host communities. He said the success of businesses depended on reliable infrastructure, security and transparent legislation. He also expressed satisfaction that the arbitration of the Memorandum of Understanding (MoU) was under the country’s jurisdiction and assured residents that the projects would commence in earnest. Chairman of 3W Alliance ltd and leader of the delegation, Umaru Abdul Mutallab, while signing the agreement on behalf of the contractors, assured the government of their readiness to urgently execute the project as demanded. Mutallab, a former Minister of Economic Development said: “We look forward to immediate commencement of the project and we will do our very best to ensure its speedy completion”. He then commended the governor for his foresight, describing the industrial park as a significant economic investment for the people of the state. Other partners in the project who accompanied Mr Mutallab included, Emilio Magoni of Impresit Bakolori, Oliver Zheo representing Longxin Group, Jackson Ilusiantei from Nebei Port in China, Emmanuel Okon of Eminence Oil and Chemical and Rabi Momoh who led the team from Heritage Bank, Olojede Alani of New Insurance and Bolarinwa Sanmi of Pan Africa Capital. 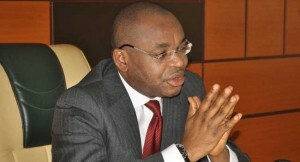 Those who signed the agreement on behalf of the state government included the Attorney General and Commissioner for Justice, Uwemedimo Nwoko, Commissioner for Investments, Trade and Industry Prof. Eno Ikpe and the Senior Special Assistant to the Governor on Technical Matters and Due Process Elder Ufot Ebong.